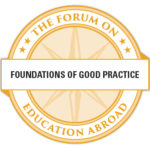 This workshop focuses on Mission, Ethics, and the Code of Ethics for Education Abroad. Participants will discuss the importance of mission and ethics in the field, and will delve deeply into the Code of Ethics by understanding its history and application through a variety of case studies. 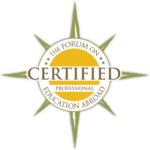 This qualifies as a Forum Certification Workshop and part of the Foundations of Good Practice in Education Abroad Competency Credential. This workshop is associated with the Foundations of Good Practice in Education Abroad Competency Credential and Module 2 of the Professional Certification in Education Abroad Program.